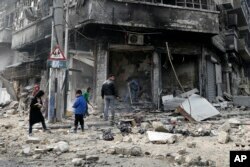 FILE - Syrians walk amid the destruction, in the Old City of Aleppo, Syria. Facts and figures are often difficult to verify in the Middle East, but estimates for the cost of rebuilding Syria’s ravaged infrastructure vary from $300 billion to $1 trillion, and most experts agree that the task of repairing the damage from 6 years of war will be not be easy. At least half of Syria's pre-war population of 23 million has been displaced, 6 million internally and another 6 million outside the country. No matter how daunting the challenge, though, some Syrians are eager to start rebuilding. Despite the absence of a comprehensive peace accord in Syria, bulldozers remove rubble from streets in Aleppo and some tenacious residents have already started to patch up the damage from six years of sectarian conflict. He said 1730 meters of metal rail, 780 cement ties, and 220 wooden trestles were used to restore the abandoned rail line, along with the removal of 330 explosive devices that militants had placed along the tracks. Fares Shehabi, who heads the Aleppo Chamber of Industry, told Syrian media that it won’t be easy to repair the damage to the city’s industrial base. He said that over $50 billion were lost (during the conflict) and that 35,000 factories or industrial facilities were either destroyed, plundered or lain dormant for five years, in addition to the many smaller businesses for which there were no records. He said that his government wants to work with both the largest and the smallest of the country’s entrepreneurs in order to help them to resume production. As two separate rounds of peace talks drag on in Geneva and the Kazakh capital Astana, with limited progress, a battle-hardened but still resilient President Bashar al Assad insists that his forces will regain control of the country and rebuild it. He told his supporters during a brief visit to a Damascus suburb recaptured by his forces that he is adamant about chasing militants from all areas they occupy and rebuilding everything that has been destroyed, in addition to restoring security. While many Syrians who oppose Assad continue to demand that he step down in the two ongoing peace forums, a close confidante of the president, Ali Haidar, pursues a low-key effort to reconcile erstwhile enemies in villages from which opposition fighters have withdrawn, like Zebadani, near the Lebanese border. He said that those who love their country and its people are seeking solutions within the scope of reconciliations in each region to solve whatever (conflicts) can be resolved. Prime Minister Khamis, however, noted the difficulties of rebuilding destroyed towns and suburbs, given the government’s limited resources and the fact that fighting is still going on in adjacent areas. He said that in the Damascus suburb of Daraya, alone, it will cost the government 30 to 40 billion Syrian pounds ($50 to $70 million) just to rebuild basic infrastructure, such as hospitals, roads, the electricity network and government buildings. U.S. and European Union economic sanctions must also be lifted before money from some of Syria's former trading partners can pour in to invest in new infrastructure. Iran, which has given Syria loans or credits of anywhere from $5 to $10 billion, according to some estimates, is vying for a number of economic and industrial concessions. China, which once ran the Hayyan oil fields, is looking to rebuild destroyed energy facilities, while India has agreed to help build a $25 million electricity plant, according to Syrian media. 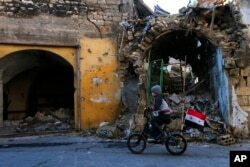 FILE - Syrian boy rides his bike past the destruction in the once rebel-held Jalloum neighborhood of eastern Aleppo, Syria. 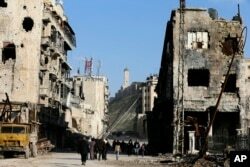 Former Syrian Deputy Prime Minister Abdallah al Dardari, who now works for the World Bank in Washington, told the Associated Press last month that much of the damage to Syria’s architectural treasures and historic sites, including parts of Aleppo, is incalculable. "For Syrians to go back home again, they need to see safety and security first and safety and security based on an inclusive political settlement which allows everyone to return to where they were forced out of, and that can only be achieved through an inclusive political process, or people will not go back or will go back partially and not feel confidant to go." He says that he will not cry over the ruins of his church, but will return and rebuild it, because that is Christ's message, that we will not be vanquished by the Gates of Hell, but will overcome it." Residents walk through damaged buildings near to the ancient Aleppo Citadel, background, that government troops used as a military base in the old city of Aleppo, Syria, Jan. 21, 2017. For economist Abdallah al Dardari, though, it's more a question of hard facts and figures, and he doesn't see Syria going back to normal without the return of the 6 million Syrians who have left the country. "We will need the Syrian middle class and professionals (who) have left the country," he insists, "to come back and rebuild." But he says he doesn't see Syria going back to normal without the return of the 6 million Syrians who have left the country. For many of those emigres, though, psychological scars run deep and it may take years before some of them are willing to return.